Monday Night Raw #1076: January 6, 2014!!! Can you believe the jury is out on this? Has Daniel Bryan (Or should I say Daniel Wyatt) turned evil/heel? What I saw was a RELUCTANT Daniel Bryan who felt in his heart that the DUTTY MACHINE won’t let him become champion so he might as well join the Wyatt Family. If that’s the case then the Wyatt Family should be a large family of black people!!!! Shout out to Tony Norris (Ahmed Johnson) and Mike Knoxxx who have debated this as of late! Y’all need to check Perfect Plex show BDSIR Network every Monday Night before Raw, Every Friday at midnight (UK time) for the Iron Curtain show, and of course STC From The UK every Saturday night! NO Blog Talk Wrestling Radio Show can touch what they do!!! Click on the pic below to take you straight to the Best Damn Show In Radio!! Well, let’s talk about the good old days… (Gladys Knight, sample on Wu-Tang Clan – Can It Be All So Simple) OL’ SCHOOL RAW! #1076 – HOL’DAT – BLAOW! OH NO! Don’t tell me the voices in Randall’s head is saying – its old school, so I gotta be the legend killer and kick my former mentor in his head!!! Yo Randall, Do you think the authority decided to have John Cena fight him again was for the fans to like??? Believe me Randall the wrestling fans DON’T like it! You mean to tell me that Ric Flair & Triple Teef hand-picked Randall 10 years ago to be the don and Randall turns round and calls the former 16 time world champion OVERRATED??? He sounds like one of them internet wrestling spoilt brats on a keyboard! IT’S RIC FLAIR N!**@!!!! Word on the street is Rikishi is in the hiz-house! In the ring are The Usos and Rey Mysterio… Now there are 4 in the Wyatts… jussayin..
Look at Danny!!! In his Wyatt uniform! I don’t know about you… but Bray hollering at Danny to get in the ring and fight Rey Mysterio and the Usos kinda reminds me of Unleashed with Bob Hoskins and Jet Li…. Look at Danny’s fighting style!!! He really does fight like a dog!!!! Next thing you know he’s gonna have a collar round his neck! OH SNAP!!! Roddy Piper has The Shield in Piper’s Pit???? WROOOOOY!!! This should be good!!!! Well let’s be real we all knew that my good friend Batista is competing in the Royal Rumble… Well THE GRANT SAYS if he wins or not…. I WIN!!! HAHAHAHAHAHAHA!!! Just like the Million Dollar Man!!!!! Shout out to my hero Kane who just told Bradley Boy about himself! If Kane gets fired or Bradley Boy ‘gets him fired’…. the mask comes back on…. AND THEN!!!!!!! HA! HA! HA! HA! HA! You best behave yourself Bradley Boy! And Kane fixed his tie!!!! F**K!N BRILLIANT!!! Hold up – Ryback looking on as Curtis Axel competes against my dude Big E Langston… Is it me or is Ryback eyeing up the Intercontinental Championship?? BIG UPS TO Roddy Rowdy Piper!!! Yo I wanna remind you that Goldust is back there rude boy!!!! This feud had me in hysterics!!!!! Good Times! with a coconut… but I don’t know if he can handle The Shield!!! Or Maybe he can! If Reigns can defeat CM Punk, does that mean him better than his comrades???? UH-OH!!! Watch the twist! CM Punk comes through with back up!!!! The New Age Outlaws rude boy!!! Yes you attitards send for your vaseline! Jerk like you never jerked before!!!! Word??? Monday Night Raw is airing live in Japan??? I think it’s only right that the New Japan Pro Wrestling should be aired live over here!!! FIX UP!!! Shout out to all the NJPW crew over at the International Wrestling Fanbase! The old schools announce table KILLS IT!!! Wires all over the shop! It’s gotta be a working health hazard surely! WHY THE F**K IS “WE THE PEOPLE” IS BEING CHANTED BY THE DUMB NUMBSKULLS CALLED THE WWE UNIVERSE??? YO – F**K THE WWE UNIVERSE, F**K THE IWC!!! I WALK ALONE LIKE BATISTA!!!! One other thing Michael Cole…. why tell us to download the muthaf***!n WWE App when you show us what happens in the wrestling match anyway???? HA! HA! The fake Americans lose again!!!! You see Zeb? Racism gets you NOWHERE! Promoting his Yoga DVDs… he and Booker-T are doing Yoga techniques… I wanna see Trish Stratus do that sh!t!!! 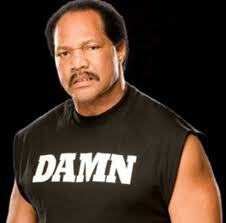 No wonder Ron Simmons entered the building and said…. WROOOOOOOOOOY!!! OL’SCHOOL RAW IS GREAT!!!!! SEND FOR THE SARGEANT!!!! I would have voted for Bob Backlund personally! THE CHICKEN WING!!! 10 years ago, if I ever got my hands on this woman her @$$ would be in a wheelchair!!!!! Hold up – Sandow’s foot was on the ropes and Slaughter counted the three for Khali! Don’t reason with Slaughter Sandow! Look w’happen – He put your brain in the Cobra Clutch!!! Now he’s dropping two foot with The Great Khali and Rajin Singh! Yo Cole & JBL – stop with the twerking sh!t – if it ain’t Eve doing it I don’t wanna know! Catch Brock’s new shirt! Eat! Sleep! Conquer! Repeat!!!!! THAT’S WHAT’S UP! WHOA!!!! Did Heyman just say that NO MMA Fighter can test Brock Lesnar??? I beg to differ! As soon as Brock got BUSS ARSE by Alistair Overeem, the so-called Beast Incarnate took his foot and ran back to the WWE! So while Heyman talks about one man reigning supreme my hero Mark Henry wants Round 2!!! OH SNAP – He done gone and broke Mark Henry’s arm… THAT’S WHAT HE DOESN’T DO!!!! BACKFOOT!!! THE BIG SHOW???? Has he come to punch Brock Lesnar through school buses??? Now last time I check – Big Show actually defeated Brock Lesnar for the World Wrestling Federation title! BACKSIDE!!! Brock tried a sneak attack – Big Show grab up Brock and dash him across the ring to BLODCLART!!!! WROOOOOOOOOOY!!!!! F**KINHELL OLD SCHOOL RAW IS DAN GARGON!!!! I dare ANY wrestling fan to complain! I’LL F**K YOU UP LYRICALLY SWORD SWINGING AT YOUR SNAKE HEAD! Photo Courtesy of Anthony Cardenas!! Happy Birthday Jacqueline Moore! The sexiest 50-year-old I’ve ever seen! Ha! Ha! You see what happen when you go Brie Mode???? YOU LOSE! 1, 2, 3 – Aksana wins!!! Play that pum-pum music!!!! OH SNAP!!! TOO COOL & RIKISHI REUNITE!!! BLODCLART!!! If I was 3MB I’d turn back….. Time to drop two foot with Too Cool & Rikishi! Michael Cole – as much as I love Too Cool… you can’t call em Hip Hop twins!!! DISRESPECT!!! THIS IS HIP HOP TWINS! Big up to the crowd chanting ‘You Still Got It’ to Too Cool & Rikishi! Hold up – How come the Godfather has appeared with a whole heap of legends and no hoes??!!! BLASPHEMY! I wasn’t feeling this Bad News Barrett but that podium KILLS IT!!!! HA! HA! HA! HA! Big ups to Mene Gene Okerlund! Big ups to the New Age Outlaws who just introduced CM Punk!!!! You know what attitards! I forgive you – KEEP FAPPIN!!!! This is it now! The Main Event! Can Roman Reigns brukk up my dude CM Punk??? LET’S GO! HOLD DAT BLAOW!!! You dun know if the New Age Outlaws and the Shield are at ringside YOU KNOW RUCKUS is bound to happen! OH SNAP!!! CM Punk Vs Roman Reigns – THIS IS AWESOME!!!!! You ain’t lying! The whole of Raw has been awesome!!!! BUMBACLART!!!! ROMAN REIGNS DEFEATED CM PUNK!!! That means….. that means…….!!!!!!!! RECORD SKIP!!! WHAT THE F**K!!!! JAKE THE MUTHAF***!N SNAKE!!! HE BROUGHT HIS PYTHON TO THE RING!!! THE SHIELD TOOK FOOT AND RUN! CM PUNK WITH THE GTS ON AMBROSE – BLAOW!!! HE JUST THREW THE PYTHON ALL OVER AMBROSE CARCASS!!! BUMBACLART!! Understand what has just happened! WWE kept that under lock and key! Here was us hoping that Austin or the Undertaker was gonna come out… but Jake The Snake???? What we just saw was worthy of a PPV quality. I DARE ANYONE TO COMPLAIN. What a Raw… next stop – My Birthday!!!! YES! The birthday seazon has begun! BRING ON THE WOMEN!!! JANUARY 11, 2014: THAT’S WHAT I DO!!! This entry was posted in The Infamous Informer and tagged CM Punk, Mene Gene Okerlund, New Age Outlaws, Ric Flair, Roddy Rowdy Piper, Roman Reigns, Royal Rumble, Smack Talk Centre RAW, Superfly Snuka, The Infamous Informer, The New Age Outlaws, Wrestling, WWE on January 7, 2014 by Jon P.